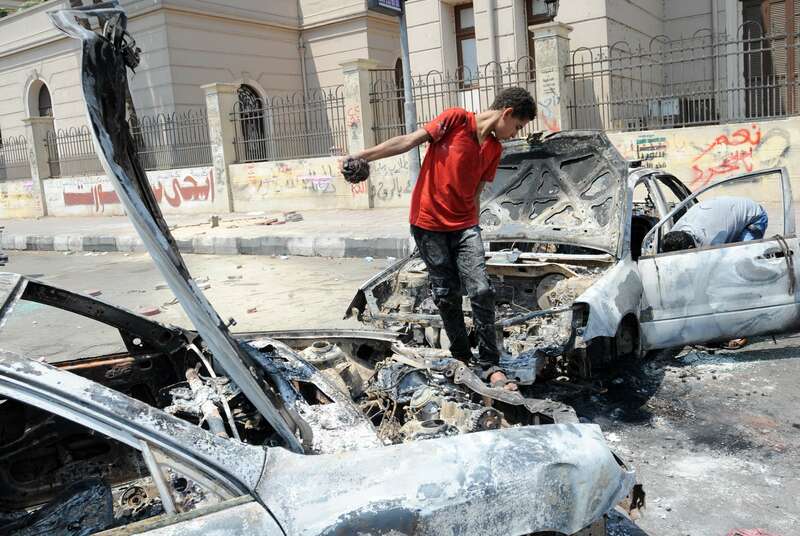 An Egyption youth inspects a burnt car near Cairo University on July 23, 2013, where supporters of Egypt’s deposed president Mohamed Mursi are holding an open sit in. Nine people were killed and 86 injured in clashes in Cairo, Giza and Qaliubiya on Monday night and Tuesday morning. The Muslim Brotherhood released a statement on their website claiming that police officers started shooting at protesters in Rabaa Al-Adaweya at 3 am, and that police also attacked the sit-in at Al-Nahda Square. The statement denied claims that protesters at Rabaa Al-Adaweya had detained police officers. Khaled Al-Khatib, head of the central administration for urgent and critical care in the Ministry of Health, announced in a press conference on Tuesday morning that there were nine injured in clashes in Rabaa Al-Adaweya and in Tahrir Square, according to state-owned Al-Ahram. However a field hospital in Rabaa Al-Adaweya claimed there were 22 injured in clashes there on Tuesday morning alone, according to Aswat Masriya. In Al-Nahda Square near Cairo University six died and 33 were injured in clashes early on Tuesday, Al-Khatib said. Among the victims was a child, who died from a bullet in the head, reported Al-Ahram. The clashes broke out after a pro-Morsi march attempted to disrupt traffic and attack vendors, according to MENA. On Monday three died and 44 were injured in clashes in Tahrir Square and in the city of Qalioub, in the governorate of Qaliubiya, according to Al-Khatib. In a statement released Tuesday morning, the National Coalition for Legitimacy denied pro-Morsi protesters intended to head to Tahrir Square, explaining that the march, which started in front of the High Court, was headed towards the United States Embassy via Galaa Street and the Corniche. The statement said the injured were taken to the Al-Nahda Square field hospital. The NSF called the Ministry of Interior and security forces to protect peaceful protesters and prevent violence. Leftist political group Al-Tayar Al-Sha’aby extended its condolences to the families of the victims of the clashes in a statement released on Tuesday. The statement called for urgent and transparent investigations into the clashes.